Water is a short video piece by vocal performance artist, Bisia Belina in collaboration with independent videomaker, Anna Malkin. 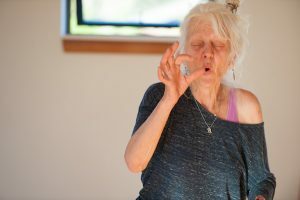 Water was developed from an improvisational vocal exploration and was featured in the larger multi-media performance, Sound is a Wave, produced by SoundBody Studio in 2017. Video documentation of the original performance is combined with additional video and performance footage to create the current video version of Water. Join us November 17 and 18, 2017 for two evening shows and a matinee performance at the Metro Studio Theatre in downtown Victoria (1411 Quadra Street). Tickets are available for sale through Ticket Rocket. You can purchase tickets online or direct from the box office. PLEASE NOTE: There will be a service charge to purchase tickets through Ticket Rocket. Partnership & Program Advertising Opportunities are available for those that are interested in supporting this community production. Contact Bisia Belina at 250.384.1133 or bisia@shaw.ca for more information. Victoria – Waves are everywhere. Waves are us. 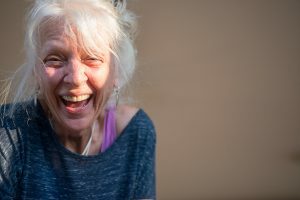 People wave “Hello” to start a human connection. Waves determine our experience of sound, water, and light. 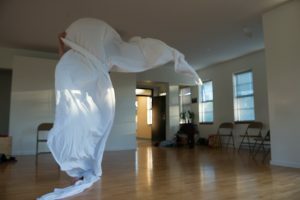 In November, artist Bisia Belina will present a voice, movement, light, and sound performance event called Sound is a Wave to explore the themes inherent in waves travelling through air as sound, and waves moving as water. It will connect sound to light (and music and movement) so it can be seen by others. 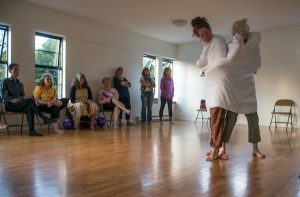 The multi-media delivery of the story helps audience members experience the message presented by 10 performers in nine compositions. 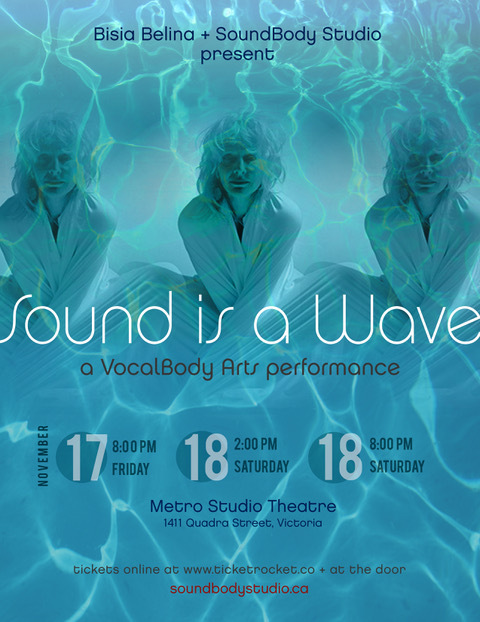 Sound is a Wave is a new music form creator Belina calls VocalBody Arts; the performance is 90 minutes long, with an intermission. 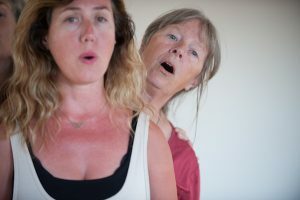 Sound is a Wave also explores the notion of claiming your voice, enabling each of us to speak up about what we believe. The performance event will also explore the waves in water and how people need to make political and social waves to protect the integrity of the life’s essence. It will also examine the nature of sound waves as words and language, and how translation can aid our understanding of ourselves. Belina is a performance artist with a performance background in vocal jazz. 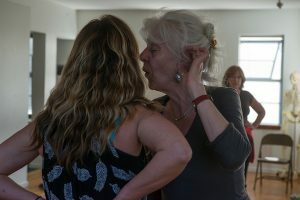 Also a registered massage therapist, she conceived and developed VocalBody Arts and is the founder of SoundBody studio, offering improvisational voice and movement solutions to life’s challenges. (September 15, 2017) Sound is a Wave Production Update & Discounted Program Ad Opportunity! Tickets are on sale now! You can purchase them online or direct from the box office at Ticket Rocket! (August 22, 2017) SoundBody Studio is Putting on a Show! 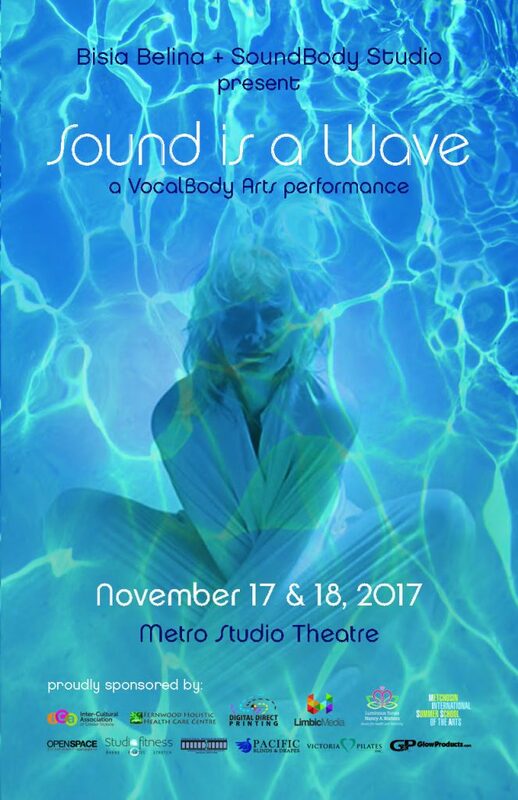 Mark your calendars for November 17 & 18, 2017 at the Metro, and plan to join us for a performance art show titled: “Sound is a Wave.” Tickets and additional information will be available soon! 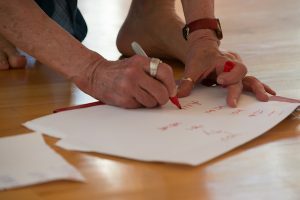 In June, 25 people came to our Call for Volunteers. 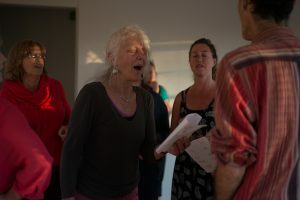 Paul Palmer, director and Bisia Belina, creator presented their vision of a show that would showcase the voice and movement work we love so much (and have been doing for 20 years!!!!). We almost have a final draft of the event poster ready to go! Darlene Arsenault who was our production manager will be contacting Front of House volunteers after august 20. She is leaving our crew and moving to Vancouver (Thank you for getting us going in the right direction!!! Discovering the fullness of you has been a pleasure. You will be missed). Anita Marshall, always on the search for Clarity, thank you for coordinating all volunteers and keeping us informed, on track and doing it all with kindness and tremendous patience and foresight. You are way more than a volunteer co-ordinator! 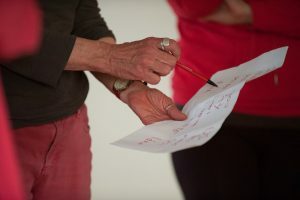 Holly Pattison, thank you for coming back into my life and taking thepics of yet another creative project!! Anna Malkin, main videographer, OMG girl you know so much!!! And most of all to Paul Palmer, Director, who is my second brand and set of eyes. I couldn’t have done this without you! Official rehearsals begin in September.!!!! Thanks for confirming times with Anita!